The Saddlery Badge and Mini Points of Tack will be on Wednesday 24th April. Please contact Iona to book in (secretary@fndponyclub.org.uk). Do any members want to order the Pony Club Black Poloshirts? Please let Iona know by 14th April so that she can place an order (secretary@fndponyclub.org.uk). Thank you to all the members who have responded to the Camp Poll. Just a reminder that you will all need to attend 3 Working Rallies before camp, unless you have already completed 3 since January this year. There were over 25 rallies listed on the Jan – May Fixture List, hopefully you were able to attend a few. The New Fixture List will be out in May with a few more rally dates. Are there any members who would like to represent their Branch at the Area 5 Horse & Pony Care Competition? Please let Iona know (secretary@fndponyclub.org.uk). The winning team from each of the competitions will qualify for the PC Championships. Mini Competition – Teams to consist of three Members. Ages to be 10 years and under on the 1 st January of the competition year, with one Member to be 8 years or under on the 1 st January of the competition year. Junior Competition – Teams to consist of three Members. Ages to be 13 years and under on the 1st January of the competition year, with one Member to be 11 years or under on the 1st January of the competition year. Senior Competition – Teams to consist of three Members. Ages to be 25 years and under on the 1st January of the competition year. One Member to be 16 years and under on the 1st January of the competition year. Minis: Questions to be based on the Care section of the E, D and easier parts of the D+ Efficiency Test cards. Juniors: Questions to be based on the Care section of the D, D+, C and easier parts of the C+ Efficiency Test cards. Seniors: Questions to be based on the Care section of the C+, B and AH Efficiency Test cards. Questions as AH Test level should be used sparingly as not all Branches/Centres will have AH Test level competitors. Following the successful Winter Triathlon Championships we are now looking forward to a summer of Tetrathlon competing. Here are the Area 5 and national dates. It is also well worthwhile keeping in touch with the Pony Club Tetrathlon facebook page which has an excellent calendar of the events all across the country. 1&2 Junior Regionals, Kelso. By invitation. 8&9 CHS Tetrathlon, Smallwood. (in conjunction with CHN ODE), Schedule available shortly. 15 Area 5 Dry Tri at Mostyn (no swim). Similar to last year’s event with younger ones riding in an enclosed field, older ones heading out over the cross country. Schedule available shortly. 12&13 Area 5 Qualifier, Warwick (with Area 7). As well as the qualifier for junior, intermediate and open classes there are classes for all abilities from the tiniest riders upwards. 27 Pembray tetrathlon, south Wales. 3&4 Senior Regionals, Kelso. By invitation. 9,10 & 11 Tetrathlon Chamionships, Off Church Bury. Including the Grassroots competition. 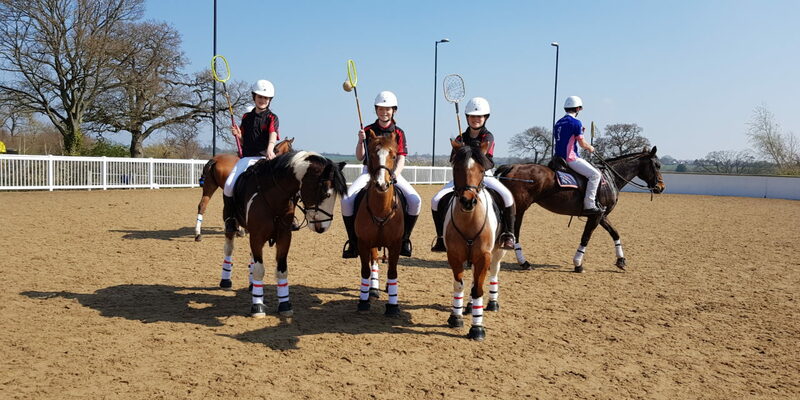 Over the weekend four Flint & Denbigh members travelled to Warwickshire to compete in the Bombers Polocrosse Arena challenge at Dallas Burston polo club. 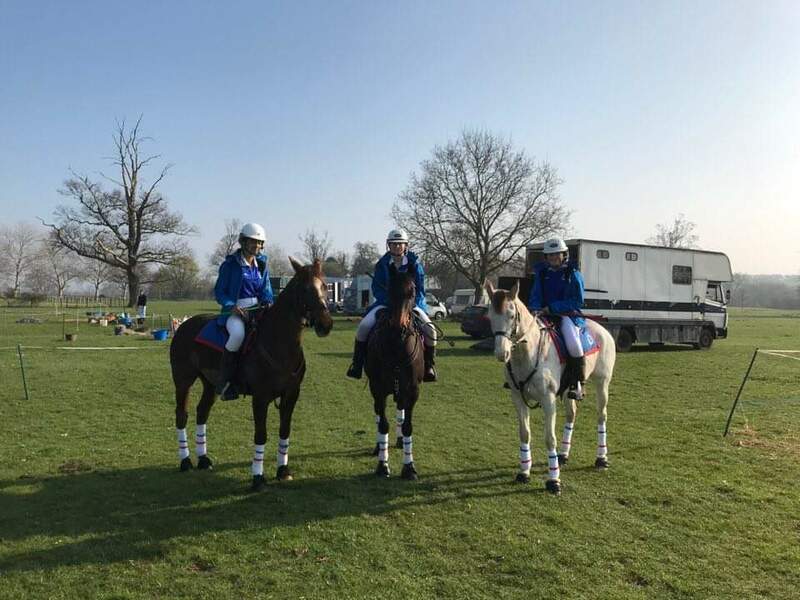 Leia Lloyd Williams, Isabella and Daisy Stone competed as a team in the Pre Juniors whilst Katie Davies joined two other Area 5 members to compete in the intermediate juniors. There was tough competition and fast ponies which made for a great competition. 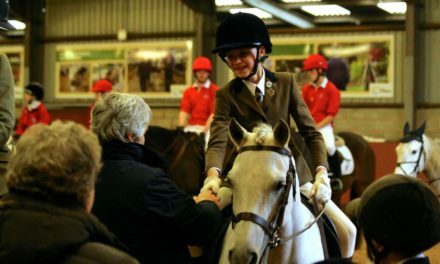 Isabella and Daisy were riding new ponies and rode brilliantly for their first competition. Great things are going to come with their new partnerships. Katie’s Area 5 team came 4th in their competition and Katie also won best no 2 rider. Leia, Isabella and Daisy’s team came 2nd with Leia winning best no 3, Romance her pony won best pony and Leia also won best sportswoman from the whole of the competition. A big thank you to Rachel Davies for her continued support and coaching.